Two of Albuquerque's preeminent research institutions -- Sandia National Laboratories and the University of New Mexico Health Sciences Center -- have a long history of collaborating on ground-breaking biomedical devices and nanotechnology. Now, that partnership has won regional recognition in the form of an "Outstanding Regional Partnerships Award" from the Federal Laboratory Consortium. The award recognizes outstanding efforts to promote technology transfer between federal government facilities and the private or public sectors. The award will be presented at the October 21-23 regional meeting in San Diego. Through this collaboration, Sandia Labs and the UNM Cancer Center (a part of the UNM Health Sciences Center), have created a novel nanoparticle called a protocell, consisting of a porous silica core infused with chemotherapy drugs and a coating that mimics cell membranes. Researchers from Sandia Labs and the Cancer Center have engineered this coating to make protocells target cancer cells more effectively. By delivering chemotherapy drugs directly to cancer cells, protocells may reduce damage to surrounding normal cells, minimizing toxic side effects. They outperform existing nanoparticle-based drug delivery by a million-fold. In another project, Sandia Labs and UNM Cancer Center scientists developed another type of nanocarrier based on naturally occurring viruses. Called “virus-like particles” or “VLPs,” these hollow nanocarriers target specific types of cells by displaying different peptides—parts of proteins—on their surface. VLPs can carry chemotherapy drugs to kill their target cells or imaging agents to help find target cells in the body. The Health Sciences Center’s partnership with Sandia National Laboratories has also yielded important advances in non-invasive cancer imaging and detection, according to Richard Larson, M.D., Ph.D., Executive Vice Chancellor and Vice Chancellor for Research. Larson, in collaboration with Senior Scientific LLC and Sandia Labs, has developed a novel technology that uses magnetic nanoparticles to detect breast, ovarian and other kinds of cancer years earlier than current diagnostics allow. As part of the collaboration, Sandia developed a method to more robustly produce nanoparticles. “Not only does it represent a very successful partnership between Sandia National Laboratories and our academic health center, but it represents the potential to have a very significant impact on the way physicians practice medicine,” Larson said. These joint projects are part of Sandia’s University Partnerships Program, which strives to nurture talent, collaborative research, and national advocacy by establishing enduring partnerships at a focused set of universities. 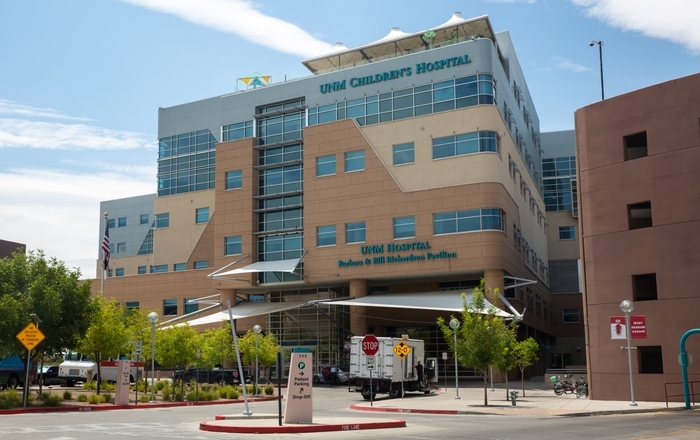 Jeffrey Brinker, Ph.D., Sandia Fellow and Distinguished and Regent's Professor at UNM, and Cheryl Willman, M.D., Director and CEO of the UNM Cancer Center, led the Sandia-UNM collaboration. The National Cancer Institute also supports the collaboration through the NCI Nanotechnology Alliance. The aim of these programs is to conduct nanoscience research while developing talent by involving students in undergraduate, graduate and postdoctoral programs. Sandia also offers the Harry S. Truman Fellowship for new Ph.D. scientists and engineers who have shown insight into a major problem and been recognized for impact in their field. Truman Fellow Carlee Ashley, developed protocells in collaboration with Brinker, Willman, Sandia nanobiologist Eric Carnes, Ph.D. and other UNM faculty, including David Peabody, Ph.D., Professor of Molecular Genetics and Microbiology. Ashley's innovative ideas combined Brinker’s research in porous silica nanoparticles and Peabody’s study of lipid bilayers that embed various small peptides. The joint team overcame daunting engineering challenges by blending the expertise of UNM’s medical and cancer research with Sandia’s materials science and nanotechnology research. Brinker, Willman, Ashley and Carnes, who are starting a new company based on the protocell technology, published their initial findings in the scientific journals Nature Materials and ACS Nano and are testing their invention in various animal models. The team is collaborating with local veterinary oncologists to use protocells for treating canine leukemia and lymphoma, the next step in the U.S. Food and Drug Administration’s approval of protocells for drug delivery in humans. The Sandia-UNM team is also extending protocell and VLP technologies to the prevention and treatment of infectious disease. Using their experience with cancer, the team believes it can rapidly develop nanocarriers for antibiotics and antivirals, a capability that will substantially strengthen Sandia’s national security mission.